Habit: Shrub, tree, much-branched. Stem: trunk bark rough. Leaf: alternate, sessile, entire, often scale-like, generally with salt-excreting glands. Inflorescence: [spike], raceme, compound raceme, [flowers 1]; bracts scale-like. Flower: sepals 4--5, generally free, overlapping; petals 4--5, free, overlapping, generally attached below nectary; stamens 4--5[many], attached below or to nectary; ovary superior, 1-chambered, placentas basal or parietal, intrusive (simulating chambers) or not, ovules 2--many; styles [0,2]3--4. Fruit: capsule, loculicidal. Seed: many, hairy. Genera In Family: +- 4 genera, 80 species: Eurasia, Africa. Note: Often in saline habitats. Stem: young stems often +- pendent, slender, +- covered by leaves, hairy or glabrous. Leaf: small, awl- or scale-like, sessile, generally +- clasping stem, generally encrusted with excreted salt. Inflorescence: raceme or compound raceme on current or previous year's twigs; bract generally +- clasping. Flower: sepals 4--5, generally +- united at base, persistent; petals 4--5, free, deciduous to persistent, white, pink, red; stamens 4--5, free; nectary disk lobes 4--5, alternate or confluent with filaments; styles 3--4. Fruit: valves +- lanceolate. Seed: hairs in tuft at tip, > seed. Species In Genus: +- 60 species: Eurasia, Africa. Etymology: (Latin: Tamaris River, Spain) Note: Invasive weeds with deep roots, especially along streams, irrigation canals. Most California species originally cultivated for ornamental, windbreaks; some hybridize. Tamarix africana Poir. excluded. Habit: Shrub or tree, < 8 m. Leaf: 1.5--3.5 mm, lanceolate, acute to acuminate. Inflorescence: 2° raceme 1.5--7 cm; bract triangular, acuminate. Flower: sepals 5, 0.5--1 mm, +- ovate, minutely dentate; petals 5, 1.5--2 mm, obovate to elliptic; stamens 5, alternate nectary disk lobes, attached to edge of disk. Ecology: Common. Washes, streambanks; Elevation: < 2000 m. Bioregional Distribution: KR, SnJV, CCo, SCoRO, SW, SNE, D; Distribution Outside California: to Washington, Louisiana, northern Mexico; native to Asia. 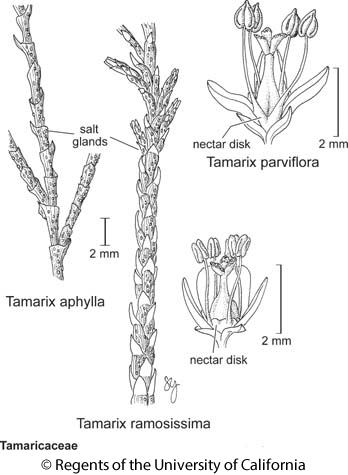 Flowering Time: Apr--Aug Note: Very similar in morphology to Tamarix chinensis; hybridizes with Tamarix aphylla (rarely), Tamarix chinensis (commonly). Citation for this treatment: John F. Gaskin 2012, Tamarix ramosissima, in Jepson Flora Project (eds.) Jepson eFlora, http://ucjeps.berkeley.edu/eflora/eflora_display.php?tid=46076, accessed on April 23, 2019. KR, SnJV, CCo, SCoRO, SW, SNE, D; Markers link to CCH specimen records. Yellow markers indicate records that may provide evidence for eFlora range revision or may have georeferencing or identification issues. Purple markers indicate specimens collected from a garden, greenhouse, or other non-wild location.